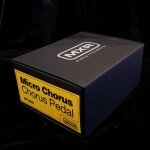 MXR M148 MICRO CHORUSWith its simple operation and stellar analog tone, the MXR Micro Chorus guitar pedal joins the ranks of MXR Classics such as the Phase 90, Dyna Comp and Micro Amp. This 80`s reissue delivers a stunning range of rich chorus textures, from sparkly watery shimmers to intense rotating speaker simulation with a twist of the Rate control. The MXR Micro Chorus pedal is designed with old-school bucket brigade technology for warm analog tone and features true bypass for pure guitar tone when the guitar effects pedal is off. Its roadworthy hardware and components are housed in a space saving Phase 90 sized box.